Without a doubt the work of Bagua stylist Sun Zhi Jun has been one of our most requested and purchased teaching series. The forms and shapes are extensions of Chinese medical theory. Now, after Sun’s passing, his disciple, Li Chun Ling, has taken up the banner and is issuing two pruned and simplified forms, one on posture and form, the other on health practice. The Cheng style is well-represented by these “foundational” tao lu. 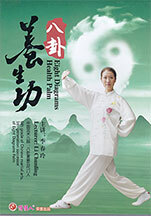 The Bagua Health Palm (24383) is probably the more difficult of the two, but its movements are pretty easy to imitate. I not would not call this QiGong, more like the preferred NeiGong. Beside a relatively large and wide spectrum of tao lu, it is clear that Sun’s instruction and methodical organization, make this version of Cheng style Bagua a lead horse in the race. 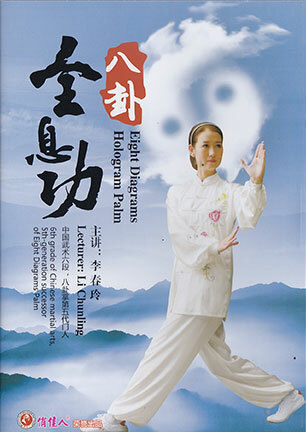 The Hologram Palm (24384) claims only one position per circle, held with a flourish for the sake of performance. The Hologram shows a characteristic Cheng posture while walking alone, with others, or even just standing. Posted August 2, 2018 by Plum Staff. Comments and trackbacks are open. Follow the comments feed.